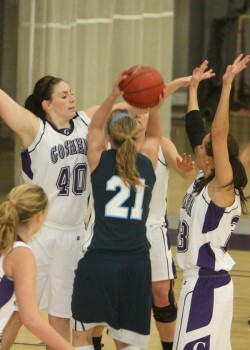 Cassie Grieves (left) blocks out an opponent in the Maple Leafs' recent contest against Trinity. Photo by Martin Brubaker. Women’s basketball team looked to bounce back from the weekend losses to #24 NAIA ranked Cardinal Stritch and a very good Ohio Dominican side these past Friday and Saturday nights. Trinity College came in with a 0-5 record before playing the Leafs and left with another loss as the Leafs took charge of the game early on, never giving Trinity a chance to come back. Goshen College Women’s team dominated Trinity Christian as Cassie Grieves, a junior, and Lindsay Gangloff, a senior, scored 14 points with Erica Yost, a junior, adding another 13 points to give the Leafs a 69-52 win this past Tuesday night. The Leafs came out firing, making 16 of 33 field goals and 3 out of 5 three pointers as they built a 37-18 lead at the end of the first half. The second period went much the same with the Leafs still in control of the game, but Trinity Christian was able to take advantage of the Leafs and hit 10 of 35 Field Goals to close the gap. As the game was coming to a close, Goshen was able to maintain a 17-point lead and close out the game to give them a 2-3 record. The Lady Leafs will be traveling to Elgin, Illinois to participate in Judson University Tournament on November 20 and 21.